Lake Maggiore region is an ideal venue for a luxury spa holiday, thanks to its beautiful landscapes and top luxury spa hotels. Enjoy a blissfully relaxed spa holiday on the shores of Lake Maggiore, within easy driving distance from Lugano in Switzerland. The central attraction of this unique region of Italy is Lake Maggiore – a paradise of inviting, sparkling water framed by rugged mountains and sprinkled with idyllic islands. There is plenty to enjoy both on the lake and on the lakeside, from the many excellent golf courses to sailing and vintage car weekends and hen or stag weekend with activituies such as watersports or quad bikes. Private transfers, Helitours and Michelin starred dinners, are just a few of the services we can organize for you. Combining the lake with a spa holiday could be the ultimate form of sublime water-based relaxation. Serene views of the lake views can be enjoyed in style from the comfort of one of the region’s top luxury spa hotels, making it a perfect destination for spa retreats and romantic weekends. Visitors should anticipate nothing but unwinding and re-vitalising, inspired by the outstanding views and lush scenery that surrounds them. Ideal for romantic getaways or a weekend spa breaks, our selection of top spa hotels near Lake Maggiore will help you plan the perfect relaxing holiday. Discover our top lakeside spa hotels below or contact us for assistance in planning your trip. Villa & Palazzo Aminta is a luxury five star spa hotel with an enviable location on the shores of Lake Maggiore in Italy, right in front of the famous Borromean Islands. In these exclusive surroundings, you will experience a real air of old-world luxury in a serene and picturesque environment. At the heart of your memorable stay is a modern, deluxe spa which perfectly complements the tranquillity of the natural environment. The Palazzo Aminta Beauty & SPA is a luxurious oasis of beauty, health and wellbeing and offers a superb selection of treatments. A visit to this luxury spa truly is a treat for all the senses – allow yourself to be pampered and taken away to a world of refined relaxation with our personalised treatments for your well-being. In this serene sanctuary, you can experience luxury treatments include Shiatsu massages, essential oil massages and customised beauty preparations that use a unique combination of deluxe ingredients. Our relaxing treatments benefit from the hotel’s exclusive signature Camellias cosmetics line, specially developed to make the most of the antioxidant properties of green tea. For a more uplifting, invigorating experience, take advantage of the host of spa treatments that will lift your spirits and leave you feeling re-energised, refreshed and ready to take on the world anew. These include Turkish baths, an ice waterfall, Scottish showers and hydro- chromotherapy, all experienced in a beautiful room suffused with golden light that enhances the magical feeling of your wellness journey. 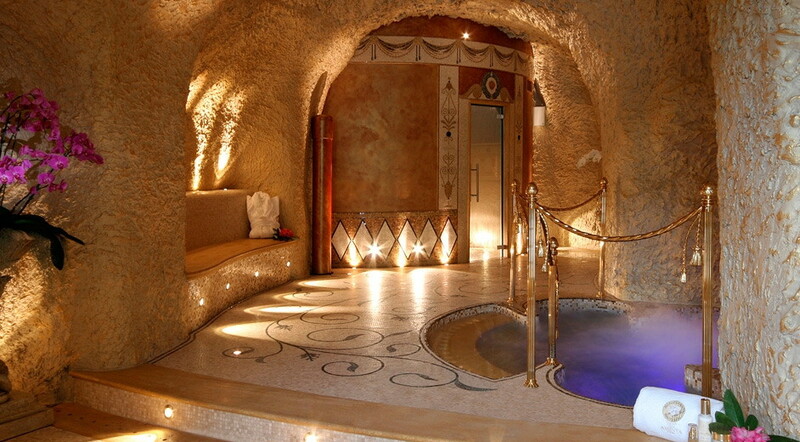 All these experiences and more are at your disposal to make your stay at the spectacular Grotta Palazzo Aminta a time that will stay with you for ever and redefine your perceptions of luxury and quality. To tailor your spa experience to your personal requirements, discrete professional staff will help guide you through your choice of beauty treatments and medical wellness therapies, including cardio fitness and massage programmes to rejuvenate both body and mind. As a perfect complement to the spa, the sumptuously luxurious accommodation and excellent hospitality provided by the hotel will allow you to continue your five star relaxation experience in style. 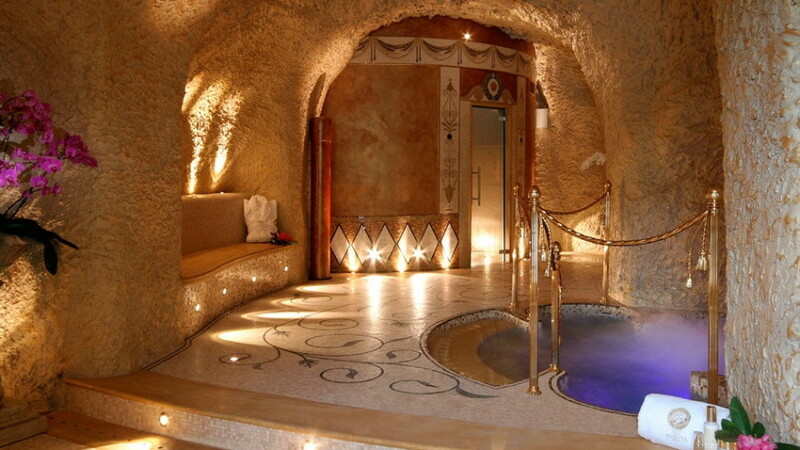 Altogether, Villa & Palazzo Aminta is a truly special venue for a luxury spa retreat.